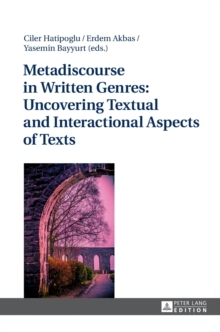 Taking metadiscourse as their starting point, the contributions to this edited volume focus both on the interactive and cross-cultural aspects of written texts from varying genres. Using rich and innovative data collection and analysis methods, comparing and contrasting patterns in frequently studied (English, Japanese) with understudied (Turkish, Russian/Ukrainian) languages, and relating empirical data to a web of theoretical frameworks, the articles in this book clearly display the variety, complexity and multiplicity of metadiscoursal analysis of written texts. The volume aims to substantially advance our understanding of the communicative nature of written texts and contributes to the advancement and expansion of researchers' interests in this field.